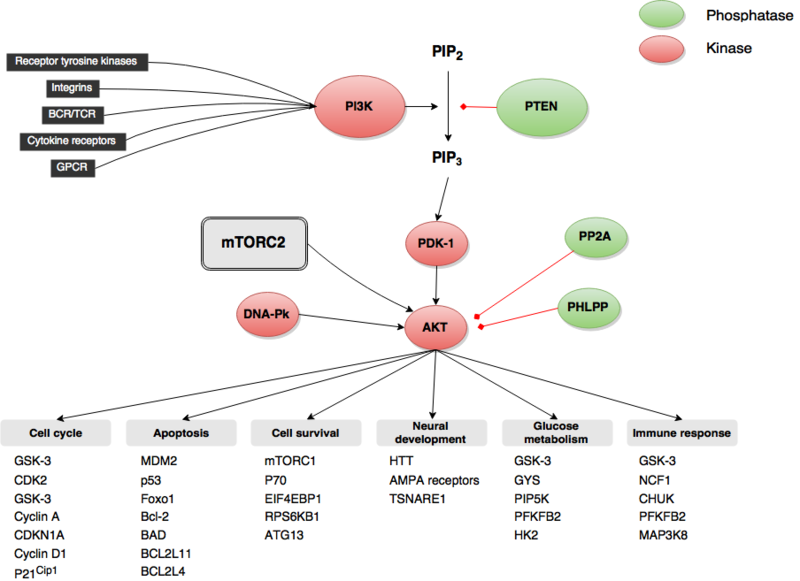 The PI3K/Akt pathway is pivotal for cellular homeostasis, neurological development, metabolism, and other processes. It regulates various aspects of cellular development such as apoptosis, cell cycle progression, and cell differentiation. The key regulator of the PI3K/Akt pathway is Akt/PKB, a family of three closely related serine/threonine-protein kinases. Akt1/PKB alpha plays an important role in cell proliferation and cell metabolism. Akt2/PKB beta is of great significance for glucose metabolism. Akt3/PKB gamma is the least characterized member of the Akt family but it is mainly expressed in the brain where it is thought to regulate mitochondrial biogenesis. Mutations in Akt contribute oftentimes to deregulation of these processes and the emergence of various forms of cancer. Akt hyperactivation also leads to increased glycolysis, thus supporting the metabolic transformation of cancer cells. Akt has been implicated in the development of cancer drug resistance and is therefore subject of preclinical and clinical research. However, Akt activation alone is usually not sufficient and other mutations are generally necessary to create the cancer phenotype. Loss of function of the major Akt regulators PI3K and PTEN can lead to hyperactivation of Akt. PI3Ks are an enzyme family that phosphorylate PtdIns (Phosphatidylinositol) to generate phosphatidylinositol 3,4,5-trisphosphate (PIP3). Upon activation by receptor tyrosine kinase PI3K phosphorylates PIP2 to PIP3 which then activates Akt signaling. 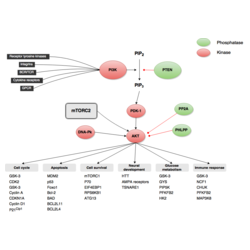 PTEN acts as a negative regulator of the signal transduction by dephosphorylation of PIP3 to PIP2.